Massive discounts on Nike sneakers, Raymonds suits, Levis jeans, Benetton tops and Khadim’s sandals – we found genuine branded gems at these factory outlets. Nike’s factory outlet is probably the biggest on the row of shops. Just a couple of metres walk from Paradise Cinema (walk away from Esplanade), you’ll find the brightly-lit outlet with massive ‘Sale’ signs. The sneakers and sports shoes (they have football boots as well!) are at 25% off but everything else from dry-fit gym wear, accessories, bags, caps, sports bras is either 40 or 50% off. They tend to have a lot of the larger sizes and the men’s collection is far more extensive but there are plenty of options in fun colours and bright prints for women as well. You’re sure to find something you like easily since the whole store is arranged size-wise and not style-wise.Although it’s still on the pricey side (nothing below INR 1,000), it’s still a huge save on the pocket. You’ll find multiple Raymonds outlets along the road but the one whose sign reads ‘Raymond’s Seconds’ is the one to walk in to. Along with Raymond’s, the two-storeyed store is also home to apparel from Colour Plus, Parx and Park Avenue. And not just shirts and ties, you’ll even get premium coats and suits, trouser material and suit lengths at these outlets. Most of the stock is about a year old but still looks in prime condition. The bad news is the discounts don’t go above 40% but it’s still a huge advantage if you’ve been saving up for a suit for your friends’ wedding. Desperately need a pair of denims. Levi’s has always been a godsend and this factory outlet is right up there in our list of places to hit when we’re broke but desperate. 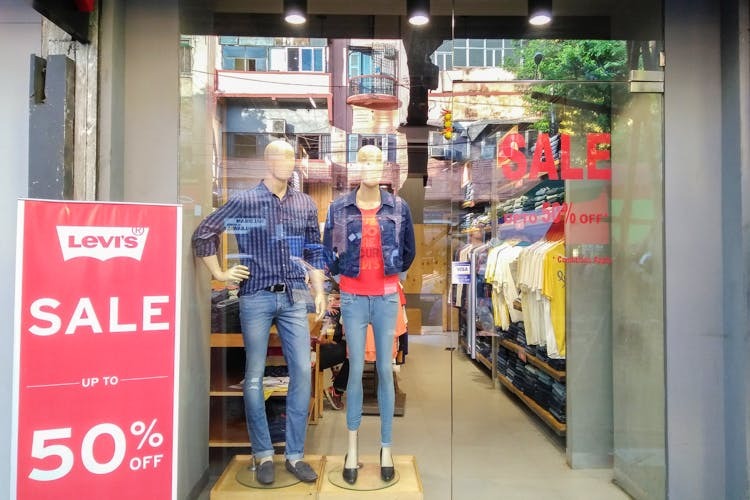 Although the tops and shirts come for just 25% discount for one and 30% discount for two, the denims are at flat 50% which is a huge tick in their favour. The Benetton store is a little hard to find as the building is under construction but just look along the row where the Levi’s factory outlet stands and you’ll find it there. There’s a flat 20% discount on everything and if you buy two items there’s a 30% discount. There are plenty of options for both men and women in both tops and bottoms. If you’re going to a tropical country on vacay soon or like hoarding clothes, stock up from here – they have the summer collections up for grabs. Huge perk: it’s really easy to find your size in the store because the whole store is arranged size-wise. The Khadims factory outlet has unbelievably low prices: sandals for just INR 200 and sneakers for INR 250! Apart from a sizeable women’s collection, Khadims also has formal shoes, sandals and sneakers for men and kids at 50%. The store tends to be crowded so you may have to haggle for attention from the staff. Carry cash! Also, you may want to take a good look at the items before picking it up. Most of the stock is old, although 100% genuine, so there may have been some wear and tear over time.